The Fast Lane RC Street Trooper by Maisto Tech is sold in a fancy display box that shows it as a robot from a distance. When you come closer and investigate, you learn that this is actually its secondary, "morphed" form. Normally it's a futuristic police car! There's a large, lighted "morph" button on the controller that allows you to transform between the two modes, and in robot form there's also a revolver-style dart shooter, also controlled from the remote. A hot car, a robot that transforms, and the ability to shoot things -- sounds like a winning combination to me! Of course the first thing to try out was the morphing function. It's very easy to use since there's just one button, and al you do is hold it down and let the Street Trooper do all of the work. It's very exciting to watch it undergo the smooth transformation. On an indoor linoleum or hardwood floor it drives around great in either mode; yes, you can still drive it in robot form. The dart cannon works well and you can either shoot one at a time or hold down the "fire" button to empty the revolver clip in just a matter of seconds. Re-filling the gun with darts can be tricky to the point of frustration, though. I found that some of the projectiles have a slightly different shape and just don't latch into their slots (barrels) well. The two slots on the upper left also seem to be more difficult to load than the others. Driving anywhere that's not a really slick, almost glossy surface, the fun meter drops quite significantly. 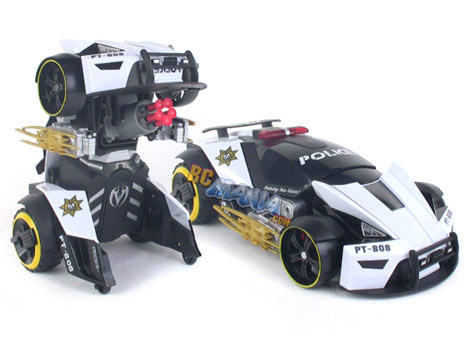 The Fast Lane RC Street Trooper uses "skid steering," like a tank, meaning the left and right wheels are driven independently and steering is accomplished by either powering only one side or driving them in opposite directions. Only the rear wheels are powered, so the fronts are just along for the ride, and they get dragged across the surface when you turn. Because there is weight on those front wheels and they're always facing forward, they really don't like to be moved side to side. The less slippery the surface is underneath the car, the more resistance those wheels will have, and the slower the Street Trooper turns. It actually gets worse the more you drive around, as the wheels start out smooth, but get scuffed up pretty quickly, which makes them even harder to slide left or right. As you'll see in the video, we were driving on a very flat slab of concrete in good condition, and the Street Trooper really labored to turn in car mode. What you can't notice from the video is that the motors were heating up from their struggle, to the point where we could actually smell them cooking themselves. This was from less than 10 minutes of normal driving, not trying to abuse the vehicle at all. Driving on even low-pile household carpet (unless it's hard, high-traffic stuff) in car mode is ill-advised. Thankfully in robot mode the Street Trooper drives just fine on any reasonable surface, it's just a little unstable due to the tall height and small base. The Fast Lane RC Street Trooper by Maisto Tech is absolutely awesome in concept, but pretty poor in reality. The transformation & shooting functions work great. Actually driving it as a car (unless you're on a perfect surface) or reloading the gun drains the excitement away very quickly. It's also a somewhat flimsy assembly and I'm very worried that a carefree kid will break one of the major joints holding the different sections together. Throw in the $50 US price with no batteries included, and I just can't recommend the Street Trooper.